So where did they start? From scratch! Since any upgrades would be a waste of money unless the quite bad layout was replanned, they began discussing the kitchen layout. The first step was to alter the floor plan in the 8×10-foot galley kitchen to add the space they needed. The basement door was moved from its place by the range to the dining room. 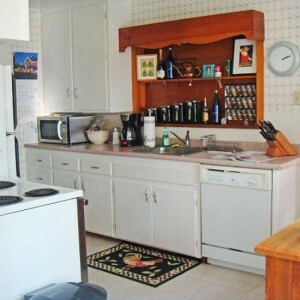 With this change, the kitchen gained 3 feet at one end and extended it on the other end by 9 inches. The move also resulted in a more open and airy feel for the whole area. The cooking range was relocated to the center of the extended wall. 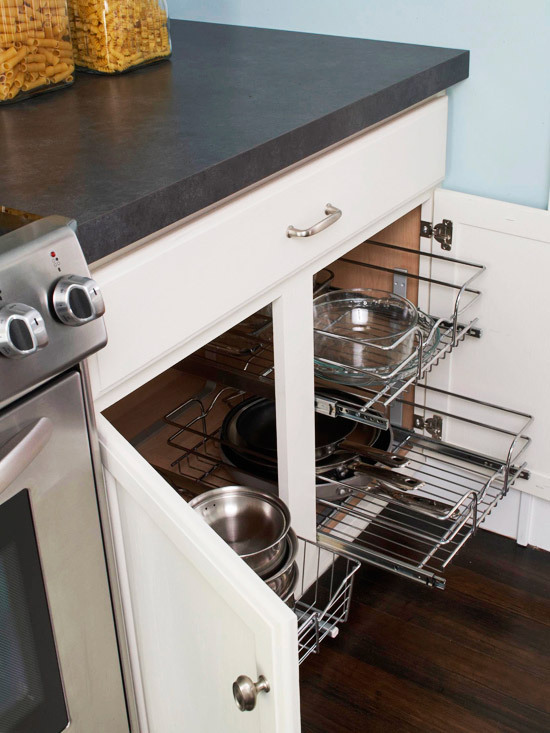 This increases landing space on both sides of the range and also provides more counter room for cooking prep. 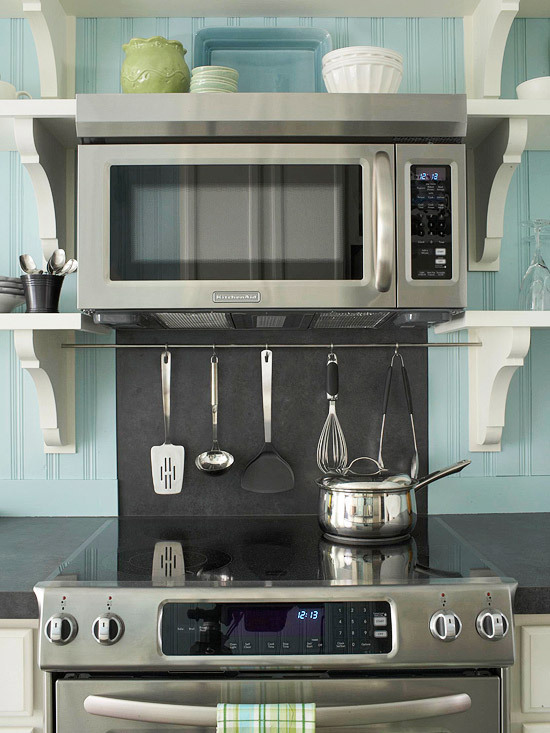 Tip: When reconfiguring your kitchen layout, consider appliance placement to ensure optimal use of counter space. 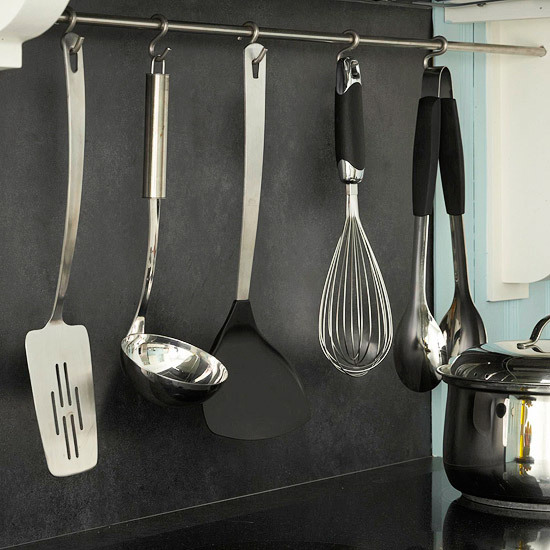 Hanging a steel rod over the oven created a useful utensil rack. It is made from a 30-inch length of steel tube, attached by drilling holes into the two shelf brackets. The black laminate backsplash (made from the same material as the countertop) provides contrast next to the light color scheme in the kitchen, while the silver touches add sparkle. Stock cabinets were given a custom touch with the installation of new pullout trays. Not only are these great for keeping cabinets organized, but they also provide even more interior space for storage. 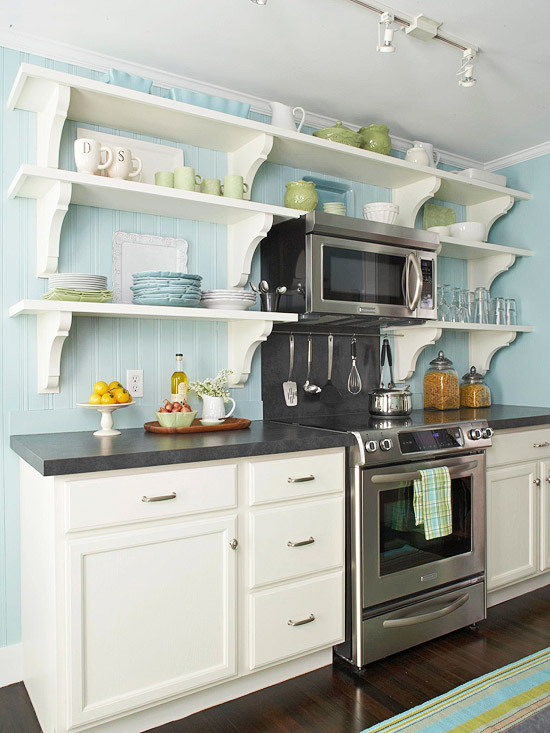 A mix of open shelving and recessed-panel cabinets provide a vintage look for this kitchen. To create this look on a budget, the homeowners used 1/2-inch pine boards with 1-1/2-inch pieces of flat stock pine attached to the front of each shelf, giving the illusion of hefty (and pricey) shelving. Tip: Open shelves help make this galley kitchen seem larger a nd are a great way to store kitchen essentials. Accessories give this kitchen a final polish. The secret to getting the finished look is to start with a list. Itemize plates, bowls, glasses, and anything else that could go on the shelves. 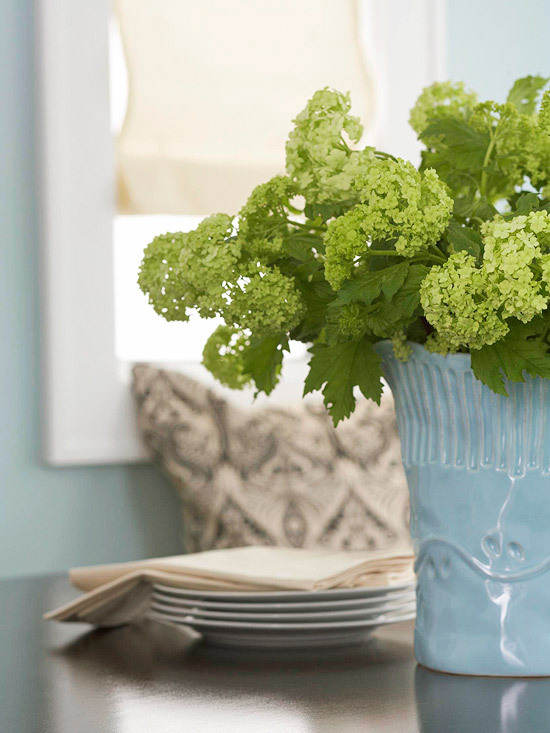 A simple color scheme, such as this kitchen’s Tiffany blue, sage green, and cream, creates a cohesive look. Tip: The numbers add up fast when you’re buying multiples, so create a budget to keep track of costs while shopping. And think pretty but practical when making purchases. The homeowner loved the look of black oil-rubbed soapstone but found a laminate product with a similar look at a fraction of the cost. Laminate also requires very little upkeep. Like most older kitchen, this one was stuck with mix and matched, old and inefficient appliances and in desperate need of updates. The homeowners’ solution was to purchase sleek, modern stainless-steel appliances. The stainless-steel plays off of the satin-nickel components of the kitchen design, giving an unforgettable look to the room. Tip: By budgeting for updated appliances you can end up saving money on your utilities bills because new models are more efficient than old models. 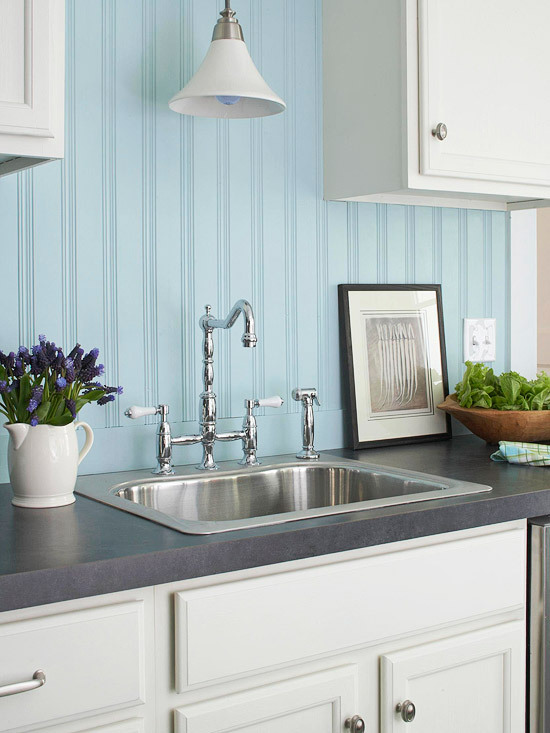 Switching a double-bowl sink to a single-bowl sink to maximizes counter space in the kitchen and keeping it in the same spot is a smart budget move. Keeping the sink in the same location means there is no need to relocate the plumbing. 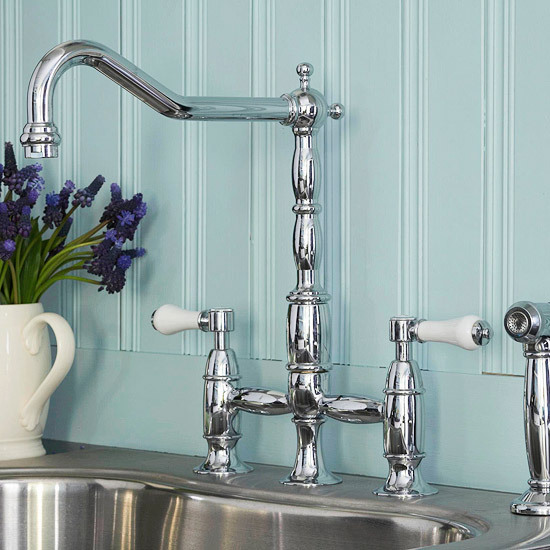 The $425 vintage-style farmhouse faucet was a splurge for a modest budget, but the vintage-embellished element adds character to the simple lines of the kitchen, and the homeowners were able to offset the cost by installing a simple sink. Tip: When planning your remodel, decide where you want to splurge and where you want to save. Stock molding and blackboard paint creates a message center for less than $25. 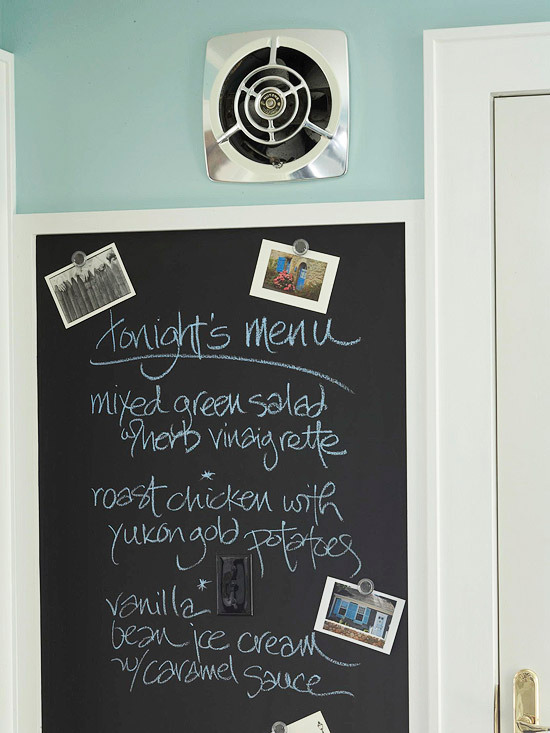 A handy place to keep notes for your family, the blackboard is an inexpensive detail that can add both personality and convenience to your room. 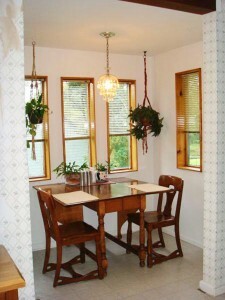 Replacing a window at the end of the kitchen with a new, energy-efficient French door provides easy access to outside. 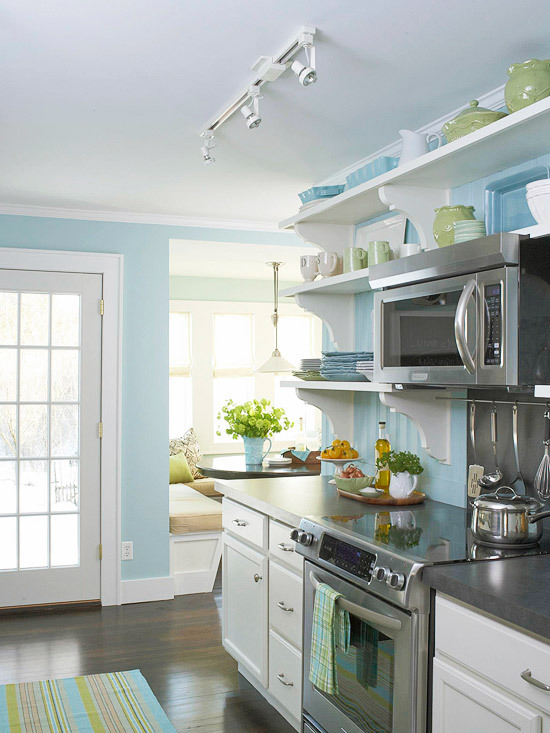 This functional and charming white door adds natural light into the room and helps carry out the kitchen’s color scheme of Tiffany blue and cream, which was selected to help play up the home’s cottage roots. The space around the breakfast nook was tight. Seating allowed only limited room for guests, and the nook had absolutely no storage. The homeowners wanted a way to better use this available space. With the help of a custom-made bench, the nook was converted into a beautiful banquette. This transformation not only allowed for more seating, but the new flip-top benches provide handy storage space. Prioritize your budget wisely; know where to splurge and where to save. Consider both function and appearance when remodeling. When space is tight, use accessories that have a practical purpose, such as pretty dishes and glasses for everyday use.